* For fully customized figurine, you will have the option to customize the figurine attires & posture to your own requirements. * Figurine height can be made to as short as 10cm or as tall as 18cm. Any taller request will not be recommended to be made using polymer clay as it might not be long lasting. 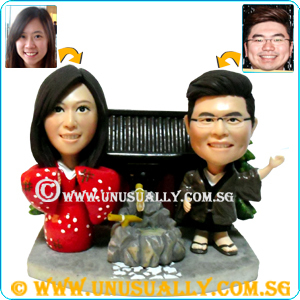 * As this is a 3D caricature figurine, we promise our customers a 60 - 70% resemblance to the photo supplied but not the real person as artists refers to the photo to hand-make the figurine.